Obviously, this isn’t directed at you guys. 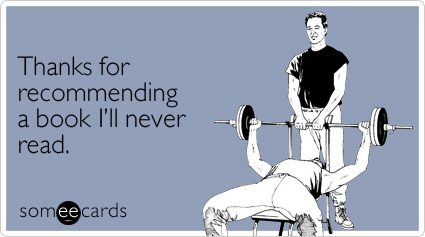 You have good taste! I’ve just started reading The Innocents by Francesca Segal, which is a modern adaptation of Edith Wharton’s The Age of Innocence. I became quickly engrossed by the characters in this Jewish community in London, so it’s off to a good start. I also came across this nifty website called “What Should I Read Next?” You just plug in one of your favorite books, and it gives you a list of similar reads. For example, typing in The Lord of the Rings will offer books by C.S. Lewis, T.H. White, and Douglas Adams. Some picks were on the odder side, including Dr. Seuss and Homer, but for the most part, I think it’s a cool tool. I had to laugh though, because when I typed The Innocents, I got J.K. Rowling’s Quidditch Through the Ages as a recommendation! I highly doubt that there’s a connection between these two stories, but I guess we’ll see! So test this site out, and let me know your results! Was it a hit or miss? Vote for my 20th (and possibly last) book of the year! Ok readers, I have a favor to ask of you! I’ve set a goal for myself that I will read 20 books this year. Actually, this goal wasn’t intended, but looking at my reading pace a few months ago, I figured 20 would be a nice, achievable number (I’m not including any non-fiction I’ve read this year). Many of you probably read 20 books in a month, but alas I have sacrificed most of my potential reading time to grad school. Anyways, I’m currently reading my 19th novel, A Desirable Residence by Madeleine Wickham (aka Sophie Kinsella), which is a pleasant piece of chick-lit after my run of dsytopian classics. And now I’d like YOU to vote for my 20th book of the year! (Considering how busy I am writing my final paper and preparing for the holidays, it’s quite possible that it might even be my last book of 2011! *cue ominous music* DUN DUN DUN!!! So let me know which one I should read and why…My fate is now in your hands! I hope you all had a wonderful Thanksgiving break, and–of course–thanks for reading! Winter is definitely upon us, as the temperatures drop drastically and night falls earlier each day. Anyone who’s gotten to know me a bit knows that I loathe cold weather. I love the food and family gatherings during the holidays, and reading a book while drinking hot cocoa in front of the fireplace is so relaxing, but those are only the Kodak moments of winter. The rest consists of rain, fog, dry skin, and ugly, bulky clothes. Seasonal depression is very real, and the first book I think of when winter arrives is Edith Wharton’s Ethan Frome. Published in 1911, it narrates the story of Ethan Frome, man who lives in the New England town of Starkfield with his wife Zeena. 20 years prior to the start of the story, Ethan falls in love with his wife’s cousin, Mattie, as he walks her home after a night out dancing. Zeena suffers from a chronic illness, and Ethan meets in Mattie in secret while she’s sick. Eventually, Zeena discovers their affair, and it’s up to Ethan and Mattie to decide what to do. I won’t spoil it, of course, but the cold, snowy setting is pivotal in their decision. This book is definitely not my favorite, as the plot was relatively sparse. It’s also not nearly as good as Wharton’s Age of Innocence, which quickly became one of my favorites after reading it this summer. However, what was enjoyable about Ethan Frome was Wharton’s extensive use of symbolism. I read the novel senior year of high school, and I still remember my essay in which I analyzed the deeper meanings of cats and coasting. Unless you love everything by Wharton, I would suggest you skip this novel and pick up Age of Innocence. It’s also about adultery, but the tragic passion is not just symbolic, it’s tangible. Ethan Frome, on the other hand, won’t keep you warm on a blustery day–and it certainly won’t make you want to go sledding any time soon. Earlier this month I borrowed Edith Wharton’s The Age of Innocence from my local library. 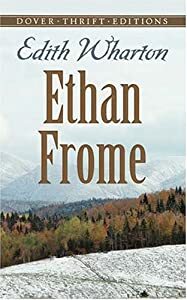 I’ve said before that I read her novel Ethan Frome in high school, which I didn’t enjoy, partly because the tone was so dreary, but also because I believe that it takes maturity to fully appreciate Wharton’s work. The Age of Innocence takes place in New York during the 1870s and opens with protagonist Newland Archer at an opera with his very wealthy, elite relatives and friends. He admires his fiance May Welland for her youth and purity. However, May’s cousin, Countess Ellen Olenksa, comes to town, bringing with her a scandalous reputation. Rumor has it that she has fled from her horrendous husband in Europe into the hands of his secretary. Now she wishes to gain her family’s support as she attempts to divorce her husband and live independently. Of course, Ellen’s mysteriousness and refusal to live according to social norms makes her irresistible to Newland, who is growing bored with Old New York society and its thirst for controversy and gossip. The two quickly fall in love, and the novel follows their forbidden relationship. Will Newland and Ellen choose passion over propriety? There’s many reasons why The Age of Innocence won the 1921 Pulitzer Prize (the first Pulitzer given to a woman, by the way). Wharton obviously knows what it’s like to live in a prestigious family, since the saying “keeping up with the Joneses” allegedly refers to her maiden name. The details that she uses to describe all the people and places immerses you within the story. The emotions are real and heartbreaking, the characters moving and unforgettable. Although very different in style compared to Emily Bronte’s Wuthering Heights, they share the same majestic sentiment. I highly recommend this novel, not only because it’s one of the best of all time, but also because its themes are timeless. I also recommend the 1993 movie adaptation by Martin Scorsese starring Daniel Day-Lewis, Michelle Pfeiffer, and Winona Ryder: the dialogue is word-for-word, the actors fit the characters perfectly (other than the women’s hair color), and the story is just as beautiful. Overall, The Age of Innocence is both an exquisite read and watch.